The following are a few of our clothing sources. We understand it can overwhelming with so many selections so please contact us with your needs and we can do the looking for you! Port Authority - Port Authority, Sport-Tek, Nike, Hanes, Gildan, Hanes and many more. Alpha Shirt Company - Devon & Jones, Adidas, Columbia, Dickies, Champion and more. River's End Trading Co - River's End, Nike, Dri-Duck, Storm Creek, Izod and more. Bodek & Rhodes - Ultra Club, Bella, Van Heusen, Arnold Palmer, Toppers and more. Heritage Sportswear - Sierra Pacific, Alo, Cubavera, Code V, PGA Tour and more. S&S Activewear - Alo, Badger, Bella, LAT Sportswear, NYNE, Bella and more. 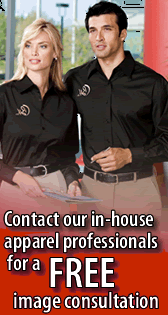 Vantage Apparel - Vantek, Izod, Gildan, Hanes, Alo and many more. Ash City - Ash City, North End, Extreme, Il Migliore. Teamwork Athletic - Athletic jerseys for every sport. Holloway USA - High quality athletic warm-ups, jackets and accessories. Tonix - Athletic apparel for every sport. Admiral Soccer - Wide variety of soccer jersey styles. Signature Sportswear - Athletic jerseys and sports apparel. Teamco Sportswear - Athletic jerseys for every sport. Augusta Sportswear - Wide variety of athletic jerseys and apparel. Wolfmark - High quality service apparel.